Mr. and Mrs. Scatter love planning Thanksgiving dinner, even if it’s just them and The Large Smelly Boys. They love writing up the menu, ferreting out the special recipe file, taking stock of ingredients, making lists, shopping, splaying out the bounty. Then on Thanksgiving day, they put on music and start chopping. They put out a nice spread of appetizers and pour some wine. They both happily bustle around the kitchen, nibbling and testing. The big feast is a time of thanks, good food and good friends, but, really, it’s the long, slow process of getting there that they savor. Basically, it’s Norman Rockwell meets Currier and Ives, if only their paintings could also convey the cozy warmth of a fuzzy blanket and scratch ‘n’ sniff cooking smells. Yes, that’s exactly the Scatter household on Thanksgiving day. WAIT A SEC! WAIT! WAIT! WAIT! Back up to the “splaying out the bounty” part. A handful of years back, Mr. and Mrs. Scatter were at this point in the process, a few days before T-Day. They had just finished the exhausting list-making and marathon shopping. They had just unloaded all the bags and set out all the food. The way-large kitchen island and all the counters were completely covered with supplies for several days of cooking and eating. The island was much too big for the kitchen because Mrs. Scatter (Mr. Scatter refuses to take the rap on this one) stubbornly had it custom-built to fit a sink on one side and all the recycling bins on the other, and often cussed it when two butts couldn’t squeeze by in the aisle, but loved it at times like this. They had counter space up the wazoo, and every speck of it was covered with potatoes and yams and onions and carrots and celery and oranges and cranberries and bread and olives and wine and cider and stuffing stuff and on and on. Mr. and Mrs. Scatter had also brought home a giant supply of chicken thighs (serious poundage, scarfed regularly by the Large Large Smelly Boy for breakfast, lunch and dinner), which were spread out neatly in a Pyrex dish, topped with marinade and baking in the oven. Mrs. Scatter started to assemble ingredients for dinner when she noticed a light through the oven window. She thought she had left the light on, but it wasn’t a soft, yellow color. It was an unusual bright blue-white, and glowed like a sparkler. Or more like a blowtorch. It was so pretty. She stared at it, strangely attracted to it while also trying to make sense of it. She got closer and peered through the window. But it was no ordinary oven light. It was an intense sparking fire. She hollered to Mr. Scatter, who hollered back and ran over. She turned off the oven. Nothing. (More hollering.) She ran downstairs and turned off power to the oven. Nothing. (More hollering.) She grabbed flour. 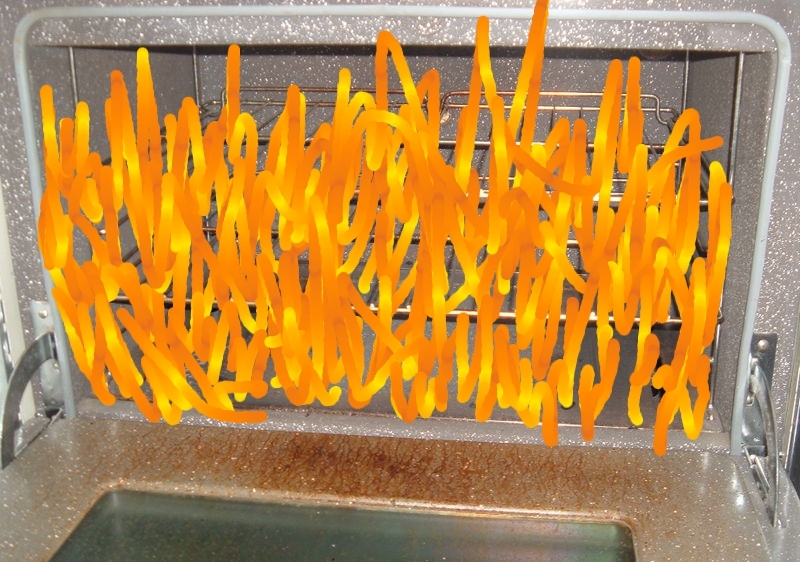 She opened the oven door, worried the oxygen would make the fire flare, but it just kept sparking at the same rate. She took out the dish of chicken and put it on the stove. She dumped flour on the fire, creating a misty cloud of dust. Nothing. (More hollering.) The fire meticulously followed the coil at the bottom of the oven, mysteriously glowing through the dust cloud, and didn’t get bigger or smaller. She dumped more and more flour, creating a bigger and bigger cloud. Nothing. (More hollering.) She got out a fire extinguisher, read the instructions, opened all the parts and stood there, not sure what to do. The spark wasn’t getting any bigger, but she didn’t want the rest of the oven to catch fire. It was getting closer and closer to the end of the coil, and she worried what it would do when it got there. (More hollering.) Finally, she aimed the extinguisher right at the fire and let fly. A giant chemical cloud poured into the oven and right back out again, mixing with the flour dust. Immediately her throat seized up with an awful toxic taste. The light never wavered through the haze. The spark was getting closer and closer to the end. She let fly with the extinguisher again and again and again, each time the cloud pouring in and out of the oven. She watched in panic through the dust as the fire approached the end of the coil. Closer and closer. (More hollering.) It inched along, reached the end, flared up and fizzled out. Blackness. Silence. Just like that. Mrs. Scatter, still holding the extinguisher, stared at the charcoal coil while blue and white spots flashed in her eyes. The dust particles floated down and settled. She and Mr. Scatter finally relaxed, took a deep chemical breath and looked around the kitchen. A soft white dust covered absolutely everything, from the top of the window sills to the floor. All the food, all the containers, all the blinds, all the raw chicken. Every surface was covered. It was like a blanket of fresh snow, only in the house. Slightly in shock, Mr. and Mrs. Scatter rounded up the Large Smelly Boys and went out to dinner. After they got home, they put the boys to bed and started cleaning. They washed out the sinks. They filled the dishwasher. They dumped towels in the laundry. They thoroughly washed all the produce. They washed down every surface, every blind, every window sill, every cupboard. They scrubbed and cleaned until the wee hours of the morning. First thing the next day, Mrs. Scatter called an appliance repair service. Late Wednesday afternoon, a guy with a tool box showed up. He opened the oven, pulled out the old charcoal element, plugged in a new one and handed over a bill for a few hundred bucks. That was it. But it was just in time to roast a few special recipes. Art Scatter is posting memorable Thanksgiving stories all week. Find the first Thankless holiday story here, about climbing in the shower naked with a frozen turkey. Really.